Subzis to prevent acidity. Indian vegetables to keep acidity at bay. Whether you are in the mood for grand kormas or simple Sukhi Subzis, you will find just what you want in this section! These subzis have been prepared carefully, keeping in mind the requirement to go slow on oil and spices. And, of course, the alkaline ingredients in them will help shoo away your Acidity. So delicious and so perfect to be served with your favourite Rotis and Dal! What Vegetables help prevent acidity? For bhindi lovers we have pyaawala bhindi recipe made with very little spices and oil. Pumpkin being acidity friendly works well in this non spicy kaddu ka bharata recipe. Fibre rich cauliflower and green peas combine well in grated cauliflower with peas recipe. Iron rich chawli combines with ridge gourd for this healthy Bengali subzi called rich gourd and amaranth subzi. 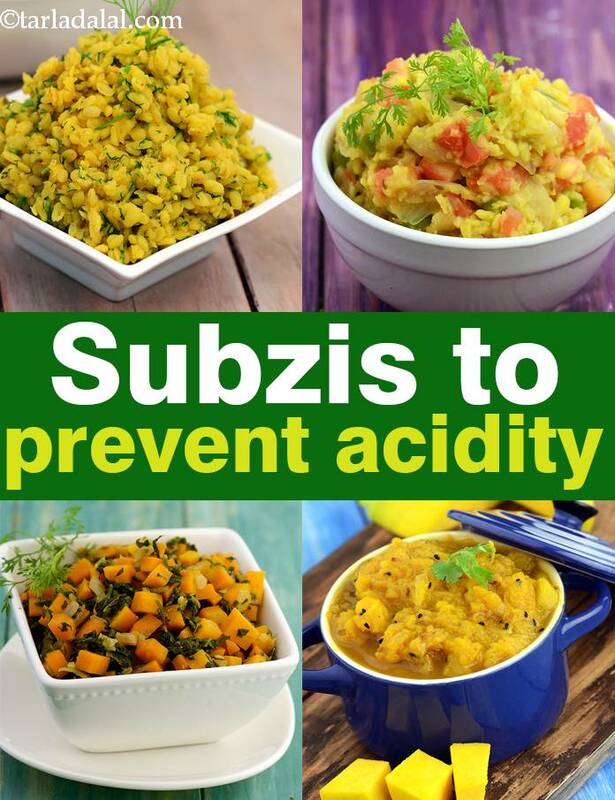 Enjoy our Subzis to prevent acidity. Indian vegetables to keep acidity at bay and other acidity recipe articles below.